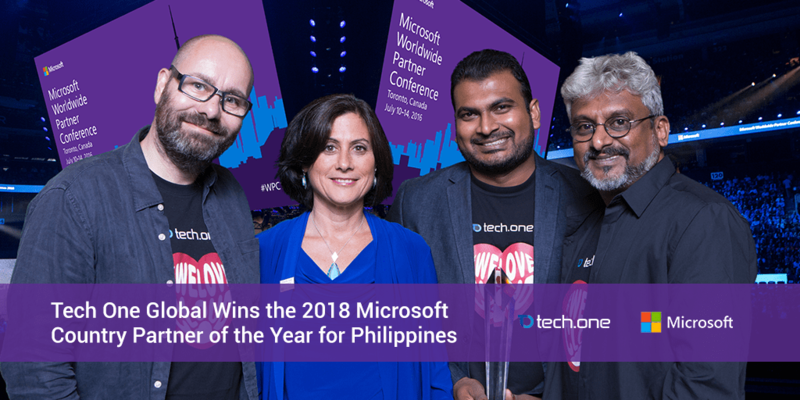 Manila, Philippines — June 8, 2018 — Tech One Global today proudly announced it has won the 2018 Microsoft Country Partner of the Year Award for Philippines. The company was honored among a global field of top Microsoft partners for demonstrating excellence in innovation and implementation of customer solutions based on Microsoft technology. “Since starting operations here in the Philippines, we have seen a very strong shift from traditional to digital business processes and have been closely involved in aiding these organizations in their transformation. We are proud to be at the forefront of delivering solutions to our clients that drive productivity, employee engagement and deliver better customer engagements. This is our second Partner of the Year Award in the Philippines—I’m incredibly proud of the team under the leadership of General Manager Lahiru Munindradasa. We are grateful for the trust of both Microsoft and our clients and see this win as a validation of our advocacy to inspire, motivate, and empower organizations through digital transformation;” Lars Jeppesen, Tech One Global CEO & Co-Founder shared. Awards were presented in several categories, with winners chosen from a set of more than 2,600 entrants from 115 countries worldwide. Tech One Global was recognized for providing outstanding solutions and services, as well as representing excellent subsidiary engagement in the Philippines. Tech One Global is a leader in digital transformation. Established in 2003, the company has provided innovative solutions to both small business and enterprise clients ranging from Microsoft licensing, Microsoft Azure, Office 365, Enterprise Content Management (ECM), document scanning services, content services platform (CSP), Enadoc and Cloud Solutions.